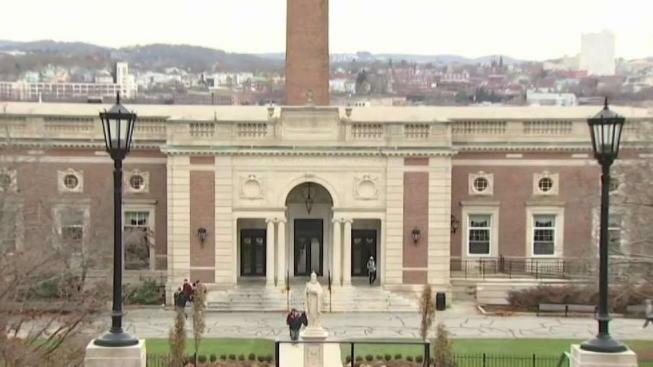 Nearly three weeks after the alleged assault of an LGBT student, classes will be canceled Friday afternoon at the College of the Holy Cross in Worcester, Massachusetts for a campus-wide discussion. College officials have not released much about the alleged attack on Oct. 27 saying the investigation is still active and authorities are trying to protect the privacy of the person who made the report. Officials with the college's Department of Public Safety said since the alleged incident, hundreds of students and faculty have called for a break from classes to focus on building a community of inclusion. Student Government Association co-presidents Meredith Coolidge and Adrian Cacho teamed up to help organize the "Engage Summit which will begin at 1 p.m. Friday. "I was horrified by the idea that this happened," said Coolidge of the alleged attack. "Our community belongs to all of us and everybody should feel included." "We all feel the same kind of frustration and anger," Cacho added. "This is one step in the right direction. It isn't the solution." School officials said over the past few weeks, investigators have interviewed several people and watched hours of video. They won't give details about the incident but said the term "assault" covers a wide range of attacks.